This blog is powered completely by solar power. It’s hosted at AISO, on servers that are completely powered by solar panels. Why is Solar Hosting Important? I am not sure how many of you are aware of the huge energy costs associated with hosting websites. I recently learned more about this, and wanted to share it with you. I feel like it goes a long way to explain the reason solar powered hosting is really important, and that the small extra price that you must pay for solar hosting is worth it if you are concerned about the environment. These servers are incredibly energy intensive – they use a lot of energy, and they give off a ton of heat. 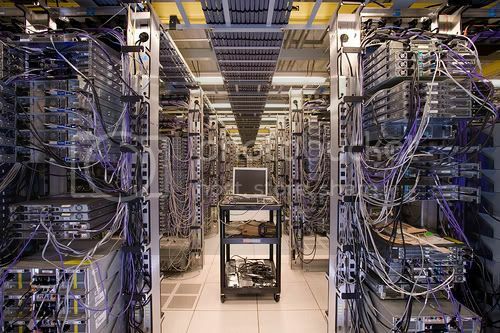 The servers are so energy intensive that businesses often have a hard time getting enough power from the grid to power their racks. This also at least partially explains why Google has been in the news recently for their interest in the power and utility market. Google knows that energy is crucial to their business. Without the needed energy to support the interwebs, there won’t be many people googling anything. Without lots of people googling things, there won’t be many people clicking on Google’s ads. Without that ad revenue, Google won’t be the big time company they are right now. It’s easy to dismiss the environmental impact of your online presence. This is a great example of the type of impact (or cost) that organizations tend to externalize – it’s outside the realm of their day-to-day operations. Hosting a website, particularly a large website, has a significant energy cost. Accounting for (in other words, internalizing) these external costs is one of the many approaches that is different for a business that is using a Triple Bottom Line approach. The good part? Making a change to how your website is hosted can have a nice impact on your environmental bottom line. Seems like demonstrating the long term benefits vs. the short term costs is the rub, and monetizing the environmental bottom line. Oh yeah, what’s congress arguing about right now? Something about caps and trade?